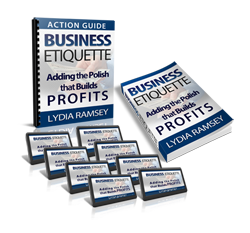 Introducing Business Etiquette – Adding The Polish That Builds Profits: An audio program on business etiquette by Lydia Ramsey. Lydia Ramsey is a professional speaker, trainer and author who specializes in business etiquette, professional conduct and customer service. She helps business owners and their employees; associations and their members; as well as individuals seeking to get ahead, use modern manners and the basic principles of courtesy, kindness, and respect to grow their business and promote themselves with polish in the workplace. We all know–or should know–that people do business with people they know, like and trust. What people don’t always understand is what it takes for others to know, like and trust them. What are those interpersonal skills that attract clients? What are the simple traits needed to climb the proverbial ladder of success? Here is where Lydia Ramsey and her business etiquette courses come in. Lydia knows what it takes to get ahead and to succeed in business. This course includes ten MP3 recordings, a transcript of the recordings and a PDF Action Guide. The audio files can be uploaded to your computer, smartphone, mp3 player or whatever device you prefer. You can listen to it. You can read it. You can do both at the same time if you like. And all at your leisure. Take this course whenever and wherever you want. It’s yours forever from the minute you download it. You can listen to a sample of the audio course here and read a sample of the guidebook here! 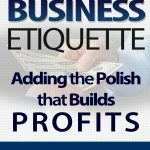 Catapult your career to the next level by purchasing and downloading Business Etiquette – Adding The Polish That Builds Profits today! Click the “Add to Cart” link below and immediately download the recordings, the transcript and the workbook.